Although Cardiff’s only an hour from home, I hadn’t been there for years until recently – and I was really missing out! 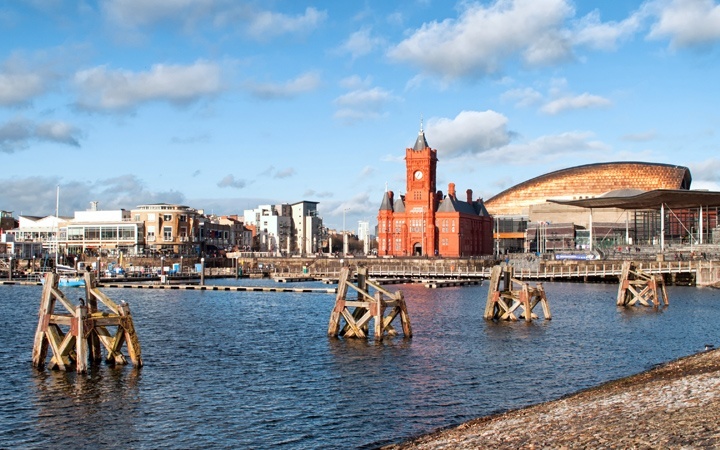 Europe’s youngest capital has a great mix of history and culture, from ancient castles to Cardiff Bay’s modern architecture and into the future as the home of TV’s Doctor Who. You’re spoilt for choice when it comes to eating and drinking too. Seasonal, local produce has become a real buzzword but that’s the type of food Wales has been doing well for years. Not to mention the local ciders, beers and even wines – you definitely won’t go hungry or thirsty. 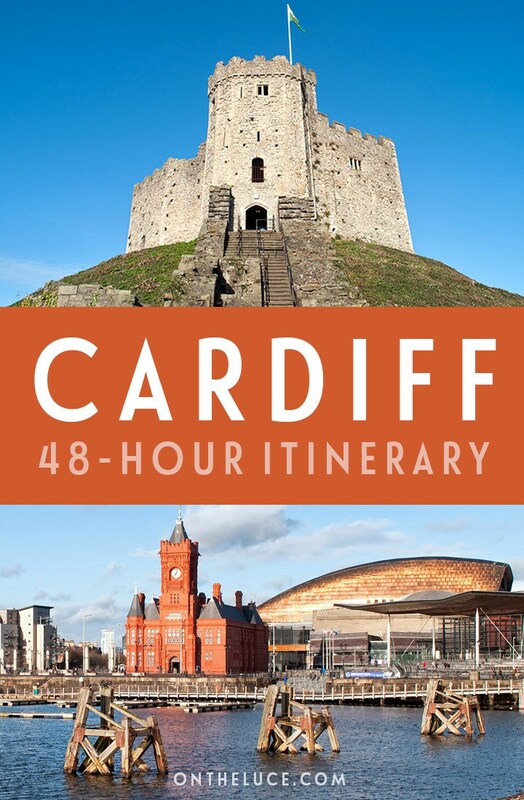 So here’s my 48-hour itinerary for spending a weekend in Cardiff. Check into boutique hotel Cathedral 73, on a tree-lined street an easy walk into the city centre. This Victorian townhouse has been converted into a stylish hotel, with rooms from small doubles to a two-bedroom suite with kitchen. There are lots of luxury extras too, like a private chef, butler and even a chauffeur-driven vintage Rolls Royce. Rooms start from £150 a night. Or if you’re on a budget, try the Sleeperz Hotel Cardiff. 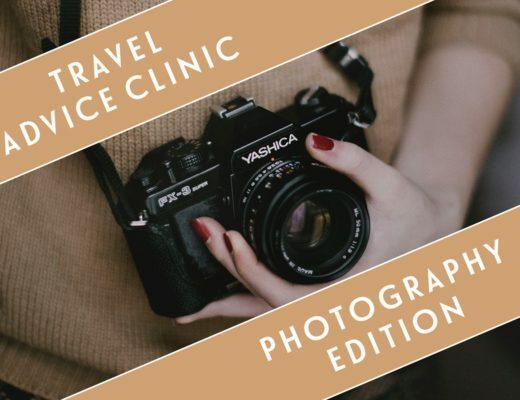 It’s one of a small chain of hotels which come with compact, contemporary-style rooms in city centre locations – this one is right next to the train station. Rooms start from £48 a night. Head into town to start the weekend off at Tiny Rebel Cardiff. This former fire station is now a bar run by Tiny Rebel, a cult craft brewing company which is based in nearby Newport. As well as 15 of their own beers on tap they also have a kitchen which claims to serve the best burgers in the city. 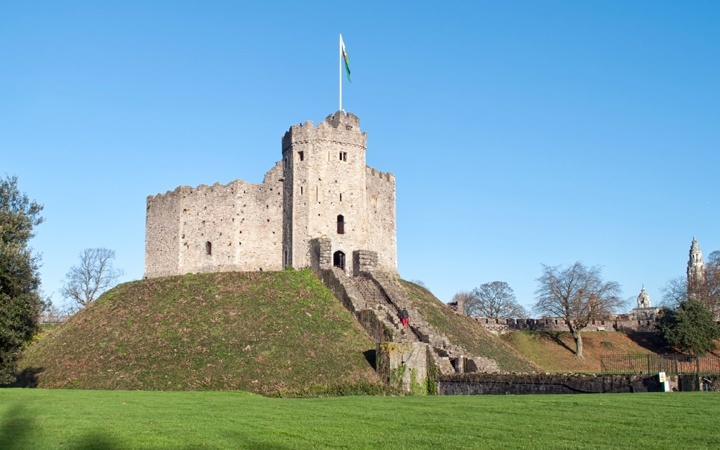 Cardiff Castle is at the heart of the city. Over its long history it’s been a Roman Fort, Norman Castle, Victorian Gothic mansion and Second World War bomb shelter. 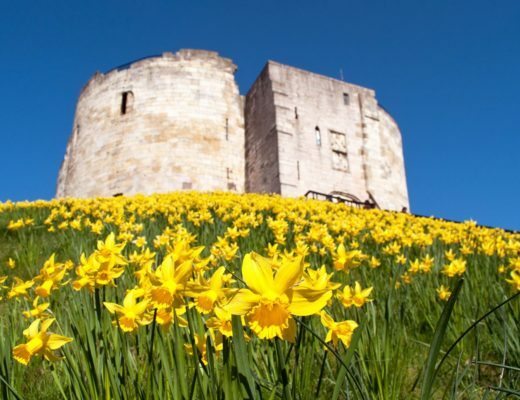 Take a walk around the battlements and grounds, and climb to the top of the keep for a panoramic view over the city. Entry costs £12.50 (£10.95 for seniors/students and £9 for children) but it’s worth paying the extra £3.25 for a 50-minute guided tour around the Castle Apartments with their ornate interiors. Tours run every hour from 10am–5pm (4pm from November to February). When you’ve finished clambering around the castle, cross the street to the Castle Arcade – one of a series of Victorian shopping arcades around the city. It’s home to Madame Fromage, a great lunch spot where you can try a traditional cawl – a soup made with lamb and root vegetables – or a local cheese platter (they have 150 varieties on sale). 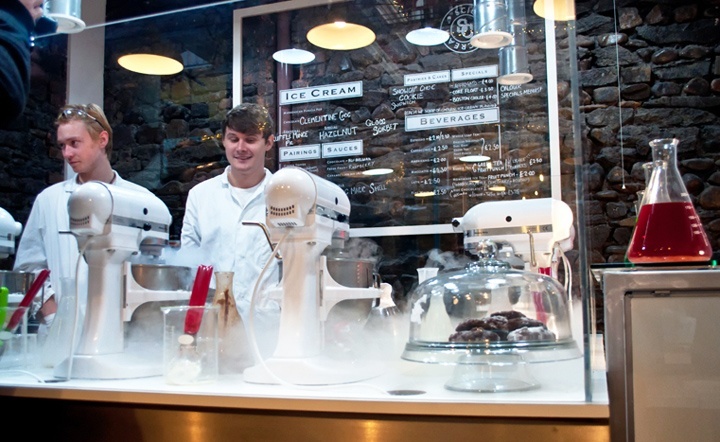 Leave room for dessert at nearby Science Cream, which uses liquid nitrogen to make super-smooth ice cream. 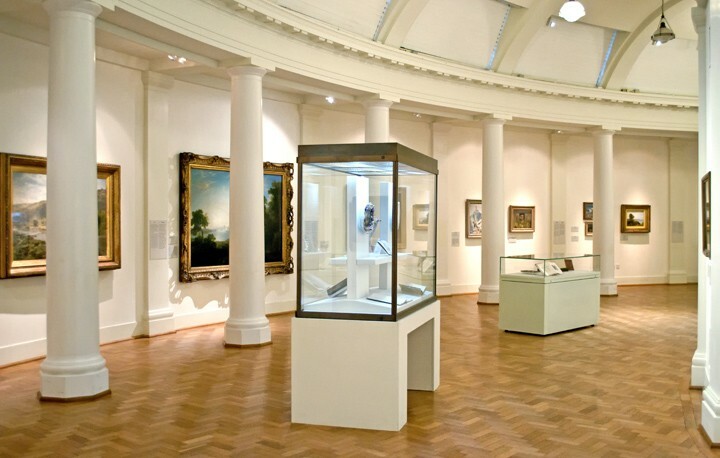 Take the short walk over to the National Museum of Cardiff next. Entry’s free, though donations are welcomed, and you get two museums in one. The ground floor is all about natural history, telling the story of the evolution of Wales from the Big Bang to the end of the last Ice Age, with everything from meteorites to wooly mammoths. Then the upper floor is an art gallery with paintings, sculpture and ceramics from Wales and around the world. Stop off for a drink at the Hopbunker, where they have an award-winning and ever-changing selection of ciders and real ales, before dinner at the Potted Pig. This former underground bank vault in the city centre is now a restaurant which specialises in modern British dishes using local Welsh ingredients. It also has an impressively huge range of gins and, to go with the name, your drinks come with a side of crispy pork scratchings. Head over to Cardiff Bay, where a huge urban regeneration project has transformed the city’s old docklands. They were originally used to ship coal out from the Welsh Valleys but are now a mixture of modern architecture and renovated historic buildings. Start off at the Senedd – the Welsh Assembly’s parliament building – where you can take a free tour to find out more about the building and the Welsh political system (open 10.30am–4.30pm). You can also take a look around the red-brick Pierhead Building which was built as the headquarters of the Bute Dock Company in 1897. Its clock tower its been nicknamed the ‘Big Ben of Wales’ and there’s a Welsh history museum inside. 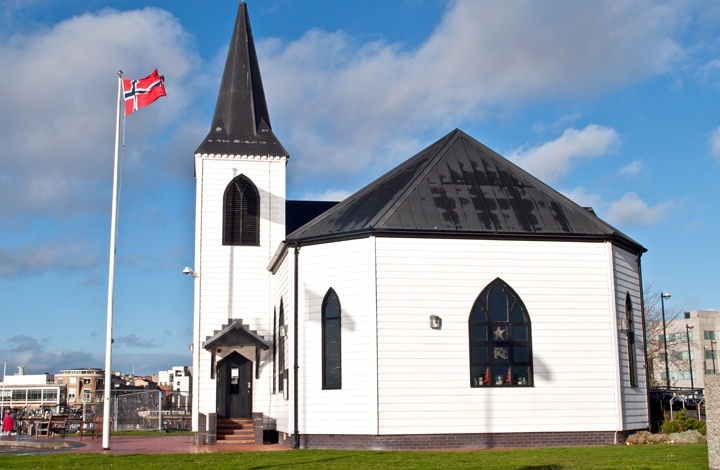 There’s also the white wooden Norwegian Church where author Roald Dahl was christened, which is now an arts centre and café. 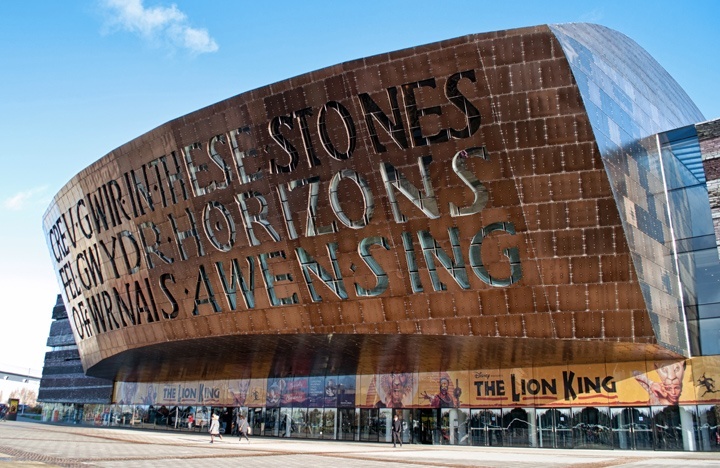 The bay’s most recognisable building is the Millennium Centre, where you can see opera, music and theatre performances. The copper frontage has a poem by Welsh poet Gwyneth Lewis built into it which is lit up at night. Translated it means “Creating truth like glass from the furnace of inspiration”. Stop at the Centre’s restaurant ffresh for lunch which has an open kitchen with a great view across the bay where you can watch chefs prepare modern Welsh dishes. For a view of the Bay from a different angle, take a boat trip. Cardiff Sea Safaris run a few different trips departing from Mermaid Quay, with a 15-minute blast around the Bay in their high-speed inflatable RIB boats for £8 per person. Or there’s a longer one-hour Coastal and Island tour which runs out as far as the Cardiff Barrage then into the Bristol Channel and on to Flat Holm Island (£22 for adults and £16.50 for children up to 14). Back on land, Doctor Who fans might recognise a few Cardiff Bay locations from the show. Since it restarted in 2005, most of the series’ filming has taken place around the bay. Roald Dahl Plass was the site of ‘The Rift’ in Doctor Who spin-off Torchwood. And under a bridge by the waterside is ‘Ianto’s Shrine’, where Torchwood fans left letters and flowers after character Ianto Jones was killed off. Finish the weekend off with a hot dog and milkshake at Eddie’s Diner, a 50s-style American diner complete with real Cadillac that’s also featured in a Doctor Who episode. 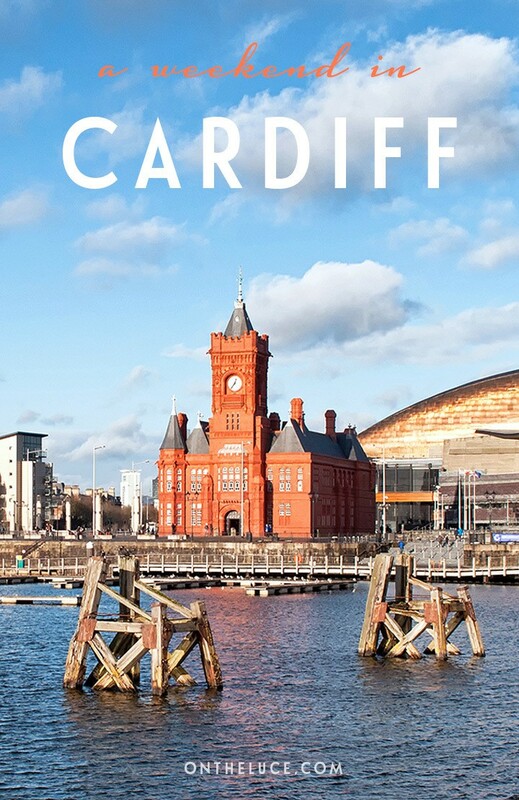 Have you visited Cardiff? Do you have any tips to add on what to see, do and eat? Thanks to Visit Wales for hosting me in Cardiff. All views and opinions are, as always, my own. This article contains affiliate links, where I get a small commission at no extra cost to you – thanks. It’s not one of the most obvious UK weekend destinations but it’s a great city and lots to explore! I haven’t been to Cardiff in years either, but it’s still one of my favourite UK cities – it’s meant to have an amazing foodie scene! We had some really great food while we were there – it’s only just over an hour from Cheltenham so I’ll definitely go back again. Did You like the cawl? I’d never heard of it until I saw it on Countryfile a while back. To be honest, I thought it looked horrible! It was actually really nice (well their version was anyway!) – it’s kind of more stew than soup really and on a cold winter’s day it was a good warming lunch. Both my brother and one of my friends were at uni down there so I used to go down quite a lot, there wasn’t much sightseeing involved though and that was about 15 years ago, so I was well overdue a visit! Loved the liquid nitrogen sorbets, I’m not usually a massive ice cream fan but they were amazing. For shame, I’ve never been to Cardiff, despite my grandmother being from there! I have seen a lot of Wales though and I think if I was there again I’d definitely pay a visit, it looks great! I’m not up with all the Dr Who stuff, that when right over my head but I loved all the random, quirky stuff you’ve recommended. How did I not know about the Norwegian Church! Sounds like you’ll definitely have to make the trip then! The Norwegian Church was lovely, not what you’d expect to see in Cardiff! I will hopeful be seeing lots of Norwegian churches in June, we are hopefully road tripping there! How fantastic! I got a little taste of Bergen and the fjords last year but would love to see more. Cardiff is not the first destination that comes to mind when thinking about a weekend away, but you raised my interested. The castle defintely looks like something I would enjoy; a scene from a fantasy movie/series. The castle was fascinating, there’s such a different range of things to seem from the old keep right up to the air shelter tunnels. Cardiff is well worth a trip sometime. Cardiff is lovely! Clear, clean and it has a castle. Love your photos…if I can ever get myself out of Italy, I would enjoy a visit here quite nicely. Thank you for a very informative article about a place I didn’t know. Thanks, it’s great for a weekend as there’s a good mix of things to do and it’s not too big to get around (plus the food is fantastic!). Hope you enjoy it – I’m going to be back in Wales next month so hope to make it to Snowdonia for the first time then too (fingers crossed I get such sunny weather as I did in Cardiff!). Thanks Charlotte – hope you have a great time! Great to hear that Valeria, hope you enjoy Cardiff, it’s a great city! I’m moving to Cardiff in September. I visited a couple months ago and fell in love. This was a great overview. The only thing I would add is to make sure you take the time to stroll through one of Cardiff’s many gorgeous parks and don’t forget to try a Welsh cake! There is a wonderful Welsh cake store tucked away in a corner of the new Cardiff Bay shopping area. Is that Fabulous Welshcakes in Cardiff Bay? Amazing place, you can’t beat a good Welsh cake! What a great write up, but only just scratching the surface of great things to do in Cardiff, a 2nd visit is in order, with St Fagans Museum voted as one of the leading tourist attraction, we’re located in this picturesque village a stone throw from the city centre! Only so much I could squeeze into one weekend so I concentrated on the city centre this time, but I have heard great things about St Fagans so will check it out next time! My friends and I are planning to do a day trip to Wales from London, because the bus tickets are so cheap. We are having a hard time deciding between Cardiff and Swansea, but after reading about the nitrogen-made ice cream I may be sold. Have you been to Swansea as well? And if so would you suggest one over the other? I really want to see as much of the UK as possible during my 4 month stay in London (I’m from America). So thanks for the post! Hi, there’s lot of lovely scenery around Swansea but if you’re coming by bus then I’d recommend Cardiff as there’s more to see and do in the city (and the nitrogen ice cream is so worth it!). Hope you have a great trip. Was looking for things to do in my local area that I haven’t visited before and thought I can help with this query 🙂 There isn’t much to do in Cwmfelinfach, it is a very small village but there are some nice walks in the area. It is situated near the Sirhowy Valley Country Park where you can walk and cycle. I would recommend a visit to the nearby Cwm Carn Forest drive where you can stay in a pod for the night or camp and there are some great views from the top of Twmbarlwm which is in the forest drive. I would also recommend that you visit Big pit on the way to the Brecon Beacons National Park. Local libraries such as the one in Blackwood will have books and photos of Cwmfelinfach over the last 100 years or so if you wanted to find out a little more about the town your grandparents grew up in. I grew up in a town about 5 mins drive away from Cwmfelinfach so happy to help if you want more info. My cousin lives in Cardiff and I am hoping to visit her soon. Sounds like an interesting place. It’s a great city – hope you enjoy it! 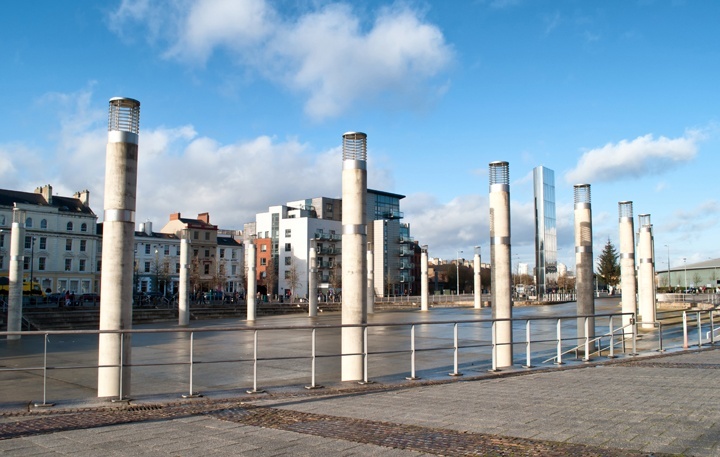 We love Cardiff, especially Mermaid Quay in Cardiff Bay, it’s so funky and there are some excellent places to eat. It’s a great part of the city to explore! My husband of 17 years is from one of the vvalleys close to Cardiff. He moved to the USA to marry me 17 years ago. He has not been back and I am hoping to be well enough to go To Wales with him. Is it Disabled friendly. I am in a Wheelchair. Also he said the Dr Who Experience moved. Too bad but I would love to visit the Castle. Hi Lucy, lovely to see that you enjoyed your trip to the capital. You have of course mentioned some of the better known places. I do feel that you ought to check out the five old shopping arcades that end in St Mary Street/High Street during your next visit! Because, these really are the gems of this beautiful city of ours. While they retain much of the character of how old Cardiff used to be, at the same time, there are also some niche eateries and cafes – wonderful cafes! I personally love the cafes during a lot and it is nice to see them doing great business during all parts of the year. Personal favourites? Well, Barker’s Tea House (Earl Grey to die for & lavender cake), Madame Fromage (another cafe for beautiful cakes and exotic cheese) and The Plan, which is my snow favourite haunt. I had some courgette cake at the Plan the last time I was there and it was just lovely. One more place is an old fashioned Italian style grocers! I am biased obviously, but I don’t think many British cities pack in as much as our arcades here in the Welsh capital! Thanks, yes the arcades are lovely – I already mentioned Castle Arcade and Madame Fromage in the article (can never resist a good cheese stop!) but some other great ideas to check out there.